Recently Microsoft started changing their Office 365 environment utilizing more Azure based service. One of the first services moved into an Azure model was the Exchange Voicemail service. It now resides in Azure. This service as a product is now named Microsoft Phone System Voicemail. Next, we need to consider the correlation with Exchange UM and Phone System Voice Mail. This reported issue "Active Directory Object missing" is most likely happen if your run an Office 365 Tenant smaller than RING 4. Mainly TAP Tenant. Else if you experience those issues within your Customer Tenant, simply follow the same procedure. The problem occurs, if there are any inconsistence between the AAD and CMS objects. Saving the configuration from CMS into the AAD object is what’s happening in the background and will therefore solve the issue. Next open the object and press "Edit"
Once the object configuration opens, don't change anything and click "Save"
If you setup your MFA, make sure you provide a 2nd phone number for recovery! 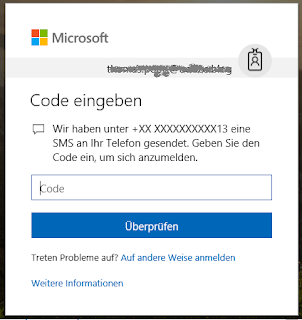 If you are switching to one of your guest tenants or in some other cases, Teams ask for a Microsoft Secure Code, sending those digit to your registered phone number. This feature for securing your account is part of the your Azure AD user settings, which requires you committing changes there. Either one or multiple Authenticators you might have set and need to change them according to your need. Sign in to https://myapps.microsoft.comSelect your account name in the top right, then select profile. Select Additional security verification. You might have experienced two issues related with not having the FOCUSED MAILBOX shown on your Outlook client. First you need to have activated Outlook with an account related to a dedicated Office 365 tenant where focused mailbox is enabled on a Organization Level. Even if one client shows up focused mailbox and another not, simply changing the accounts to the same subscription account will not activate the focused mailbox. To check whether your focused inbox is turned on, please run powershell commands referring to the steps below and send us a screenshot. Please be informed that you need to involve your admin to perform this. 1. Connect to Exchange Online PowerShell. I stepped over an interesting possibility, making TEAMS more to your prefered Modern Workplace Team Tool. You are able to add your Teams Calendar (from Office 365 Groups) into a Apps Tab. This enables you to seeing your related appointment faster. Disadvantage is, you can navigate through Outlook Web App as usual. This is generally not an issue an further more, it allows you also writing emails from within TEAMS! Not, you only see in OWA the content from the user you logged in with. Hope you find this helpful and experiment with more possible Tabs/ Apps in Teams. Sharing files with external guest is a native SharePoint feature.Teams relays on Office 365 Groups. Any O365 Group can be used and is required for activating a MS Teams. Therefore the basic settings once a Teams was created, which automatically creates an Office 365 has external non-teams-guest sharing disabled by default. We need now managing external sharing for Office 365 Group site collections. We can share files from within Teams either as Teams link or native SharePoint link. As per default setting, the Teams Groups 365 Group site collection will NOT allow sharing with external, non-member guest users. This you will see even if the global tenant level has activated the external access to file and the global SharePoint settings allow those sharing.